Try to match Allies (bats, rats, etc) in sets of three at a time, since each match scares away one Villager. It’s like getting a scare for free! Don’t get so caught up in matching items that you forget to use your collected Allies! Tap the moon icon in the lower right to send a wave of Allies at the advancing Villagers, and watch them turn and run! Every attack icon on the screen does damage with each match you make, so try and match the attacks to Coffins first. Remember, the attack damage increases by 1 every 10 levels – on Levels 1-9, attacks do 1 damage each, but by Levels 30-39, they do 4 damage each! Defense is very important. If you’re having trouble surviving, try selecting the defense boost when you finish each level (+5 to Defense), buy Coffin bonuses at the start of each level, and focus on collecting Coffins to boost the defense bar first. Use bonuses when you’re having trouble. You can spend your collected Coins on Coffin, Veggie, or Ally bonuses, each of which will last for 10 turns. Bonuses increase the chance of a particular icon appearing, but you can only have one bonus active at a time. Remember that the game isn’t timed, so take a moment and plan your next move. Keep an eye on your health bar, versus the number of attack icons on the screen, and make sure the next move won’t be your last. With that in mind, avoid making extra-long chain matches when your health is low – every icon you match means a chance of an Attack icon dropping into its place! Slow and steady matches of Veggies or Coffins are the safest way to refill your health and defense bars. Save your Coins and buy the Upgrade Points as soon as you have enough. Start by putting your Upgrade Points into the Coin multiplier – you can get your next Upgrade even faster when each Coin is worth 2x, 3x, or 4x the value! 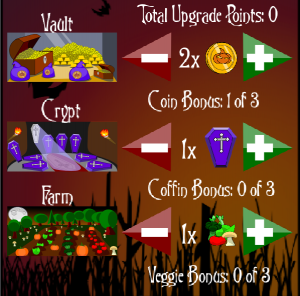 If you’re having trouble finishing levels, you can re-distribute your Upgrade Points at any time, into the Coffin or Veggie multipliers instead.